It sure does feel good having She Could Fly back with its new arc! The original run of She Could Fly was exceptional and unique and that means that my expectations were very high for its return. And just as the first arc shocked and awed me, this first issue of The Lost Pilot, the new arc, also shocked and awed me. There is a lot to unpack here in this first issue, but for the sake of avoiding spoilers, I won’t elaborate too much on the details of the story. I said it a few times in previous reviews, but Luna is such an amazingly written character and is one of my favorite current comic book characters to follow. Christopher Cantwell could not have written a more interesting and complex character to make the center of this already complex story. Right at the beginning of this first issue, I find myself right back in the groove of feeling so many different things towards her. Again, I feel bad for her, I identify with her, I’m concerned about her, I’m confused by her, and I’m slightly terrified of her. All of these feelings are right back in the new arc and intensify as the issue progresses. Cantwell also smoothly updates us on every character from the web of characters from the first arc. We get a visit of each of the other characters, even if they’re quick glances into what they’re currently up to. I adore the intricacy of this story so much and am very delighted to see that Cantwell has dedicated The Lost Pilot to setting up the continuation of it. It is almost as if the series is one of several mysteries without being a stereotypical mystery story. Instead, Cantwell molds the series into a number of different genres multiple times throughout the entire issue. One of the things that enhances Christopher Cantwell’s bizarre vision for this story is Martin Morazzo’s artwork. There are so many strange instances in this story that are driven home by Morazzo’s gorgeous and unusual illustrations. Just as impressively, Morazzo uses the moments that aren’t too busy and uses his artistic talent to fill them with the drama that keeps the story going. I engage with the characters just as much from seeing them as I do reading about them. 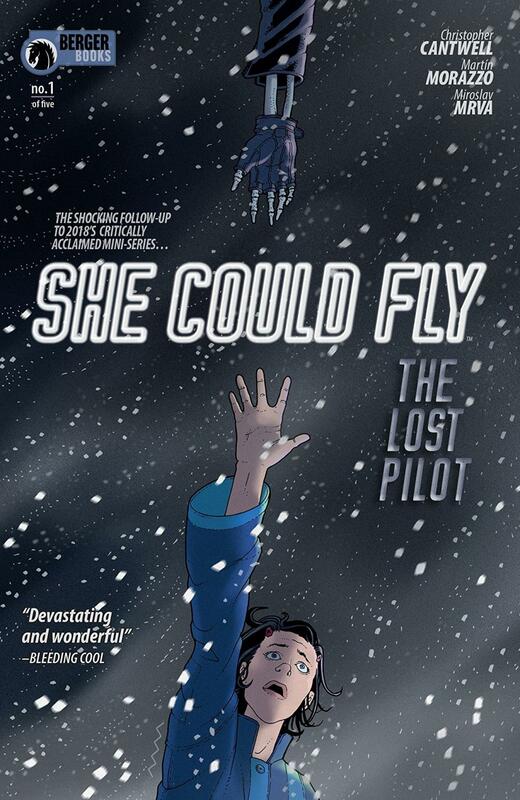 If you enjoyed She Could Fly’s first arc, you’ll absolutely love She Could Fly: The Lost Pilot #1. It contains the perplexity that we’ve come to love and appreciate from this series while also introducing us to the fact that a lot of excitement is about to come our way.